Residential Garage Doors In Victoria, B.C. 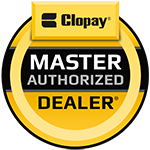 Tedford Overhead Doors is proud to be a Master Authorized Clopay® Garage Door Dealer servicing Southern Vancouver Island and the Gulf Islands. We offer the complete Clopay line of residential garage doors that will enhance the look of your home, making it an integral part of your home’s style. Our Clopay garage door product offerings are extensive; so whatever your needs may be, we have a door that will enhance the beauty and value of your home that is second to none in durability and reliability. You can choose either wood or steel carriage style garage doors from our Reserve™ or Coachman® Collections. Our Gallery™ Collection offers the carriage style garage door look at a more affordable price. If you are looking for a more contemporary look, choose from the Avante™ Collection which combines contemporary aluminum and glass in sleek modern designs. Please browse through our products below to see how they can enhance the look of your home and meet your garage door requirements. Contact us for an estimate or to schedule and installation. Tedford Overhead Doors & Gates is honored to be a Clopay Master Authorized Dealer®, dedicated to providing superior levels of professional expertise and responsiveness in sales, installation and service throughout Victoria, British Columbia. ©2019 Tedford Overhead Doors & Gates. All Rights Reserved.